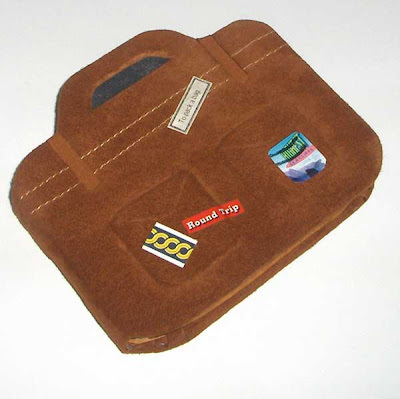 "To Pack a Bag" is another one of my items in the Modest in Scale exhibit. 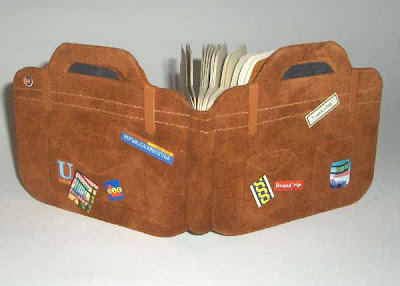 This is a hardcover case bound book covered with brown suede leather and embellished with stitching and raised areas to resemble pockets, and decorated with bits of ephemera to suggest a well-traveled bag. I had made a suitcase book for the BEST book swap and it was basically the prototype. It was a blank book with a few pages cut from maps - designed specifically for the swap since we were doing a "travel" theme. The book shown above was made afterwards with some improvements to the construction, and contains a poem that I wrote, called "To pack a bag," laser printed onto parchment paper. What a neat book. Looks great and has a lovely finish.